Located in the state of Florida, Pembroke Pines is a mid-sized city with a population of 164,753 inhabitants. With a population density of 4,988 people per square mile, Pembroke Pines is well above the nation's average density level. According to the most recent Census, 67% of Pembroke Pines residents are White, 20% Black and 5% Asian. Additionally, more than a quarter of the population of Pembroke Pines are of Hispanic or Latino origin, and 39% of the population also speak Spanish. 74% of the people in Pembroke Pines (over the age of 15) are married and 56% have kids under the age of eighteen. Knowing that, it’s safe to say that this area could be a great place for other families to lay down roots. Without the right tools, relocating to any new city can be very stressful and challenging. Living in Pembroke Pines, Florida could be a good experience for anyone who puts in the time to do the research required. With useful information like amenities, cost of living, weather, employment, housing and other key data points, finding the best places to live in Pembroke Pines and in the areas around Pembroke Pines is a much easier task. Using data and statistics Pembroke Pines has received a livability score of 82 out of 100. 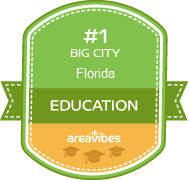 This score is ranked in the 96th percentile when compared to all other cities. Pack your bags! This is a very high score in comparison to other US cities. Living in Pembroke Pines could be a great choice! Pembroke Pines also ranks in the top 10 percent of all cities, which is no small feat! Based on the scores for each individual category, Pembroke Pines has been rewarded with high marks for amenities (A+), crime (B), weather (A) and education (A-). There is at least one category that you should be aware of in Pembroke Pines. The following was graded with a less than perfect score: cost of living (F). Location, location, location - possibly the three most important words in your search for a new place to live. Fortunately, in Pembroke Pines, there is no shortage of amazing local amenities and interesting things to do. Some of the interesting things to do and attractions include: C.B. Smith Park, Grand Palms Golf & Country Club, and ATA Flight School Tours. Crime rates can be the deciding factor for anyone looking to relocate to a new area. Pembroke Pines gets top scores for their low violent crime rates of 188 crimes per 100,000 residents, which are significantly lower than the national average. There are many factors that go into deciding if an area is the right fit for your lifestyle. Certain “must haves” like low crime, great schools and nearby amenities are all at the top of most people's lists. But before even considering if those options are available, most people will need to know if the real estate in Pembroke Pines is actually affordable. Median real estate prices in Pembroke Pines come in at $225,400, which is 35.1% higher than the Florida average. The home price to income ratio compares the median home prices to the median household income. In Pembroke Pines, the home price to income ratio is 3.6, which is 5.9% higher than the Florida average. Knowing if your home will appreciate on a long term or even a short term basis should be factored into your decision making. An increase in your home’s value can be a good way to generate tax-free equity that can create long term financial security. In the past year, appreciation rates for homes in the Pembroke Pines area were 7.7% and 5 year appreciation rates were 11.7%. How Do You Rate The Livability In Pembroke Pines? I spent the better part of the 90's living in a gated townhouse community in Pembroke Pines. Located about 10 miles west of Hollywood and not too far from the beach, overall I found Pembroke Pines to be a good place to live. I enjoyed all the amenities of a middle class suburb and endured the problems that come with such a community. Whether it was shopping at the Pembroke Lakes Mall, dinner at a nice Jewish Deli or a night at the movies, you could find it in Pembroke Pines. There was a big park and several public golf courses I used to frequent. With the good came the bad. There was a growing crime rate and traffic was becoming more and more unbearable. The city had more than doubled in size in the 8 years I had been there and I had had enough of the hustle bustle lifestyle. One day I decided to sell my house in Pembroke Pines and move. Today I'm very happy living on 3 acres of wooded land in the country, far from city life. Source: The Pembroke Pines, FL data and statistics displayed above are derived from the 2016 United States Census Bureau American Community Survey (ACS).